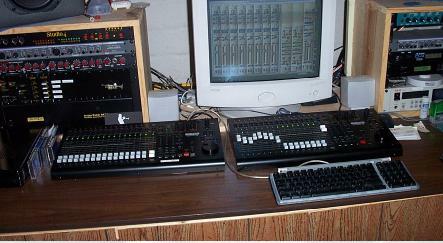 This is my 128 Track studio called "Paris". It is a very sweet sounding system! This is shown with my old monitor, which is now replaced by the one below. This is the new setup with Paris on my older G5 tower, with a Dell 20" monitor being shared by the G5 and iMac 17" core duo machine. Here are some of my keyboards, the steinerphone, and another small board. This is the Isolation booth I record in. Inside the booth with the Beyerdynamic ribbon mic. This is the DK-10 Drumkat for playing sampled drums (also some old mutes). This is my Steinerphone, also called an EVI (Electronic Valve Instrument), invented by Niles Steiner and made by Akai. It is essentially a Midi Controller that fingers like a trumpet. This is a picture of my Lawler C7 Trumpet, which was hand made by Roy Lawler of Lawler Trumpets. It's construction and design is very much inspired by the Vintage Martin Committee trumpets of the 40's and 50's, but with a more modern response, feel, and intonation. .